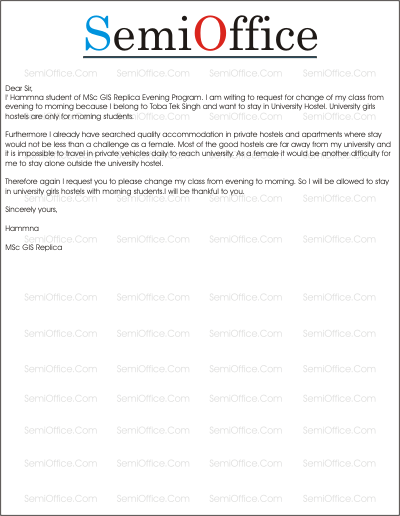 Sample application for change of class time from morning to evening and evening to morning. Request for change of class time or shift/batch/session in school, college or university. I want to say that the Public Law class which is designed to happen at 2 pm is in clash with the Criminal Law class which occurs at the same time. The students who have kept both the subjects in their first year will be missing one class if they attend any of them. So we all request to change the timings of the classes so that all the students are able to attend the classes and the lecture is not missed by them. We shall be very grateful to you. This application is to request a change in timings of the class time in college. Due the summer weather it becomes too hot at the noon at which the class of mathematics ends. Students feel much uncomfortable to return home in such hot weather. Many students have been suffering from health issues due to such atmosphere. I request to change the old time 1 pm-2 pm to new time 10 am- 11 am as we have a free period in this time. Teacher and all the students have also agreed to change the time of the class. We hope that institute would consider our application at its top priority. I’ Hammna student of MSc GIS Replica Evening Program. I am writing to request for change of my class from evening to morning because I belong to T. T. Singh and want to stay in University Hostel. University girls hostels are only for morning students. Furthermore I already have searched quality accommodation in private hostels and apartments where stay would not be less than a challenge as a female. Most of the good hostels are far away from my university and it is impossible to travel in private vehicles daily to reach university. As a female it would be another difficulty for me to stay alone outside the university hostel. Therefore,I request you to please change my class from evening to morning. So I will be allowed to stay in university girls hostels with morning students.I will be thankful to you. With all my due respect, I would like to tell you that we are going to have a MUN session in our school and for the practices and rehearsals we need one hour extra after the break timings, the issue is that we are having time clash with our math class so for that I on behalf of all MUN management team request you to change our math class timing so we can easily manage both the things. We all shall be really thankful to you for this favor, looking forward for the positive response.